The Flymo Speedi-Mo 360C is a versatile lawn mower designed for first-time homeowners with medium to large-sized lawns. This mower is part of Flymo’s wheeled lawn mowers range. This range of mowers is intended to make mowing more comfortable and faster, especially when cutting grass on uneven grounds. Speedi-Mo 360C lawn mower – What’s in the Box? The power cable measures 10 metres. This long cable makes it easier for you to mow a large lawn without having to add an extra power cord. Quite frequently, sometimes weekly during summer and autumn, you have to mow your lawn. The smell of freshly cut grass is fantastic, not to mention how satisfying it is to look at a well-manicured lawn. 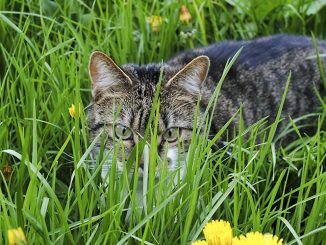 Cutting grass on a large yard can be a nightmare, especially if you don’t have a good mower. 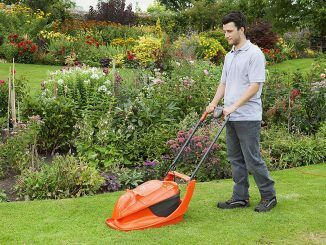 Flymo has designed the Speedi-Mo 360C specifically for medium and large-sized gardens. One of the most outstanding features of this lawn mower is its metallic blade. Most mowers, from other brands, within its price bracket come with plastic blades. A Plastic blade is not as effective as a metallic blade, and it requires regular replacement. 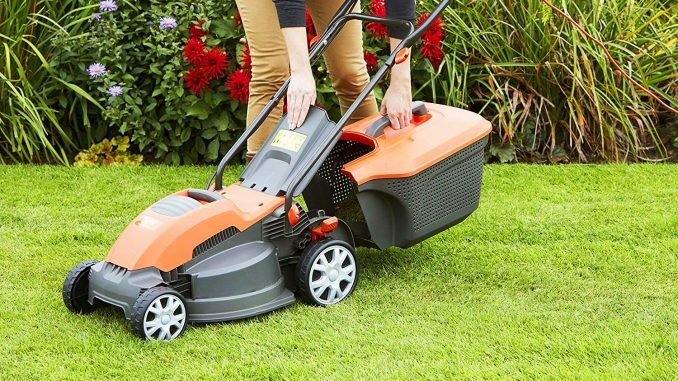 The Speedi-Mo’s metallic blade measures 36 cm, allowing you to cut grass faster. 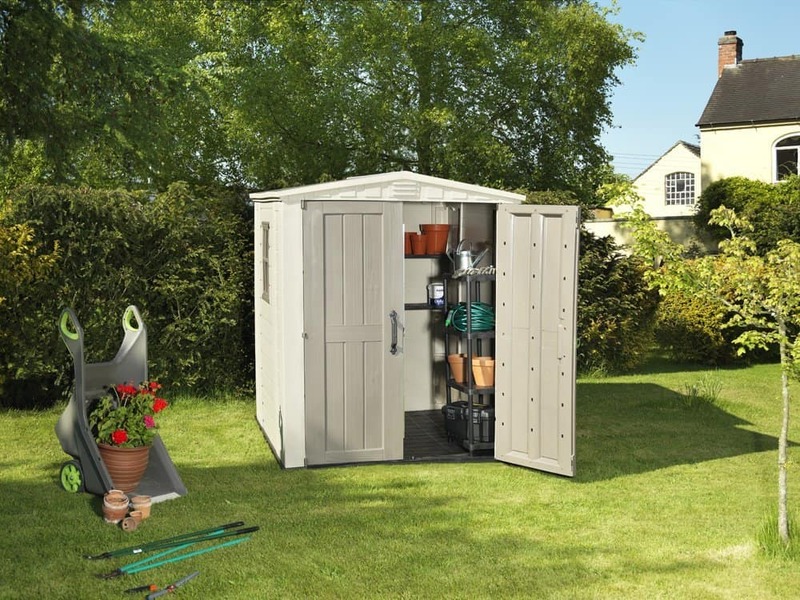 The blade works perfectly on long, short, dry or even damp grass. 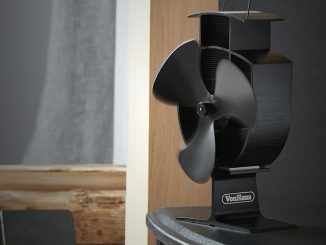 The best part is, you don’t have to replace it as often as you would a plastic blade. This Flymo mower comes with a central height adjustment system with 5 individual cutting heights. This feature allows you to cut blades of different heights efficiently. During summer, it is highly advisable you leave the grass a bit longer. This helps prevent yellowing of the lawn after mowing. During colder months, you can cut it as short as you want. The Flymo Speedi-Mo also features a powerful 1500 W motor. This motor is responsible for powering the mower. Unfortunately, the Speedi-Mo 360C cannot create stripes like roller mowers. 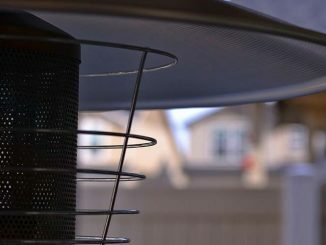 The Speedi-Mo is durable, easy to use, and efficient. Mowing a large lawn requires a robust and efficient mower. The Speedi-Mo 360C is powerful and efficient. This machine requires little assembly. To start, assemble the plastic grass box. Users have commented that even after reading the manual, they found it a bit difficult to assemble the Flymo grass box. To help with this issue, Flymo has created an amazing video to help users set up the grass box faster. Once you have assembled the box, attach it to the back of the mower. Make sure it clicks in place and then screw in the telescopic handles. These handles are made of durable steel. Use the lever on the rear left wheel to adjust the cutting height. This lever allows you to adjust the cutting height to 5 different heights, with 20mm being its lowest height and 60mm being the highest height. To start the mower, press the push button on the handlebar. Press the controls on the handlebar to keep the mower running. When you let go of the controls, the mower immediately goes off. 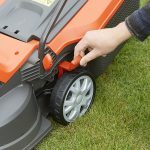 This safety feature is helpful, especially when you want to remove debris or toys on the mower’s path. The 36cm metallic blade cuts grass and weeds down to a neat finish. This cutting blade also enables the mower to cut closer to the edge than other older Flymo lawn mower models. This mower is a bit noisy compared to the battery-powered Ryobi RLM 18X33H40 lawn mower. However, you will notice there is little handlebar vibration unlike you would experience while using other mowers from other brands. All the cut grass goes into the 40L grass box. 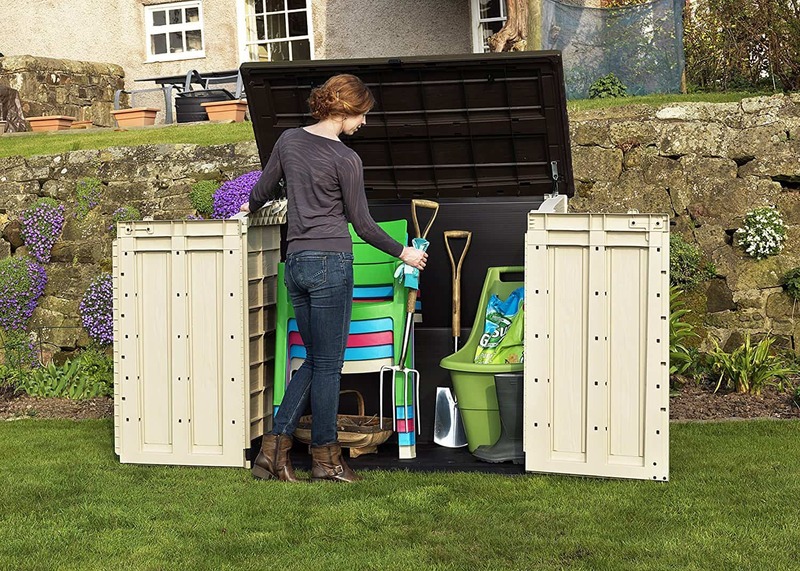 This large box compacts the cut grass, minimizing the number of times you have to empty it. Use the flap on top of the mower to check if the box is full. The carry handle allows you to remove the grass box easily. This grass box is made of sturdy plastic. The Speedi-Mo 360C is easy to manoeuvre. Its wheels enable it to move on uneven grounds smoothly. 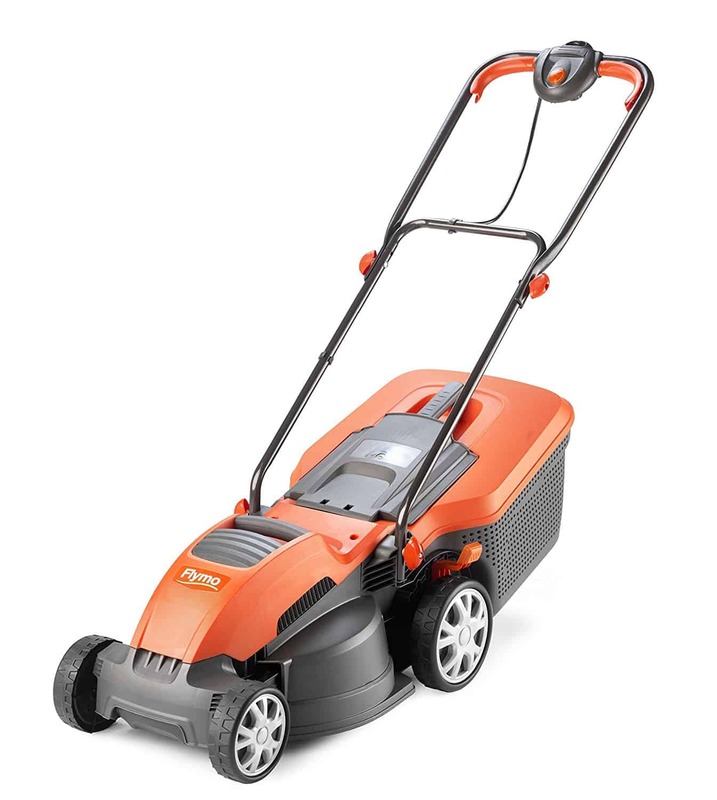 Users have commented that this mower is lightweight and comfortable to push around. You can use the carry handle on the top side to move it around. The Speedi-Mo 360C is small, so it doesn’t require much storage space. 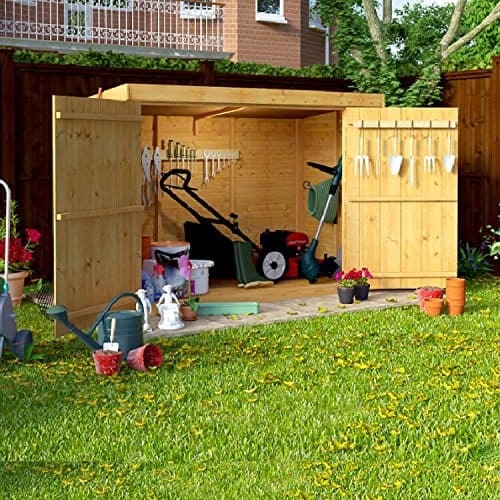 To put it away, remove the grass box and handles, then store it away in your shed. 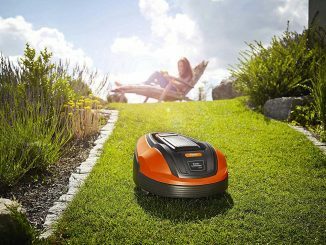 So, why should you consider the Speedi-Mo 360C lawn mower? Is it better than other mowers within its price range? 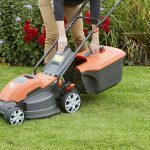 Honestly, the chances of finding another mower with a powerful motor and a metallic blade within the Speedi-Mo’s price range are very slim. Most lawn mowers from other brands with similar features to this Flymo mower will cost you more. This mower is made of sturdy plastic and steel. This means that with proper maintenance it can last for years. Flymo Speedi-Mo comes with a 1-year warranty that can be extended to 3 years. 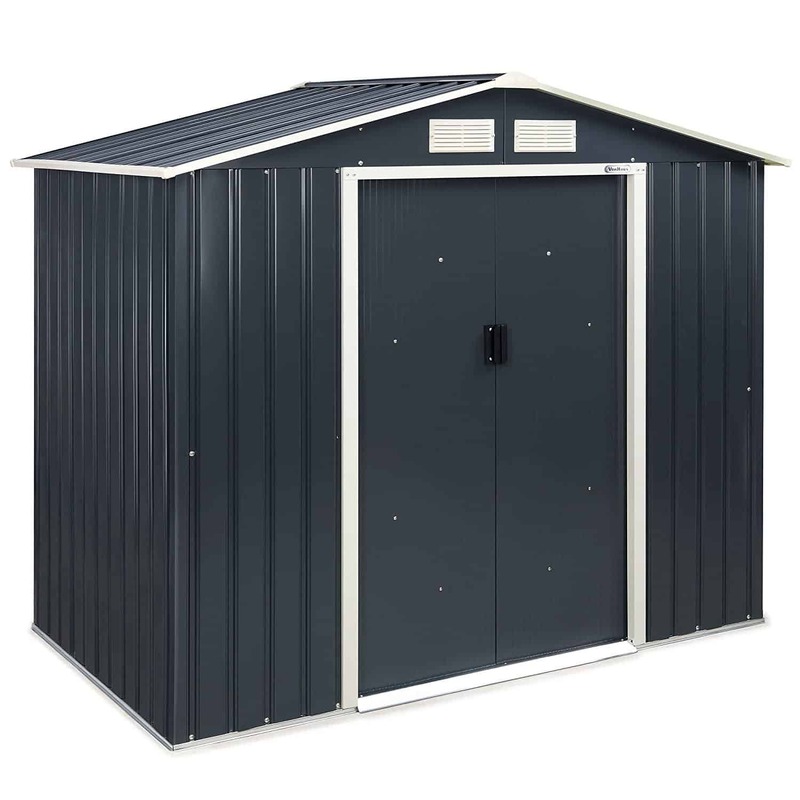 This machine is affordable, easy to assemble, and efficient. Finding the perfect mower among the various models on the market is not an easy task. 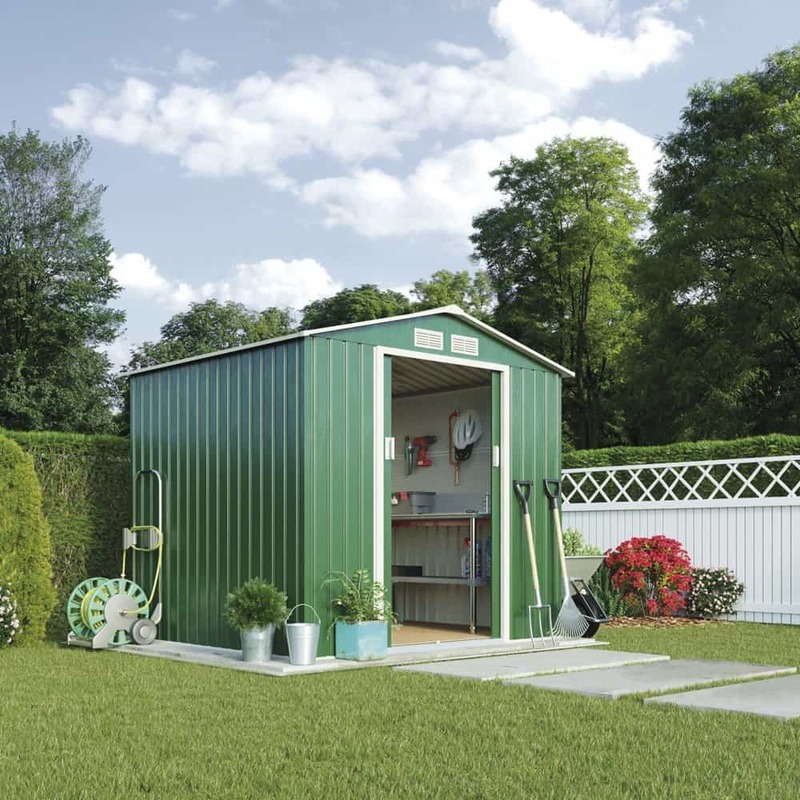 A good mower should come with a metal blade and a large grass box, be lightweight, durable and easy to manoeuvre. These characteristics can all be found in the Flymo Speedi-Mo 360C wheeled lawnmower. This mower is designed for the British market. 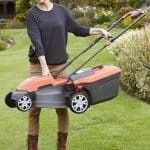 At Garden Shed Reviews we believe that this versatile mower will meet all your gardening needs. 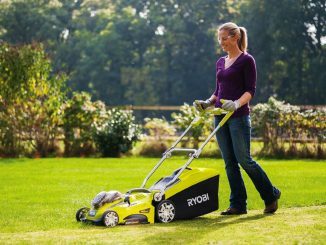 The Flymo Speedi-Mo 360C is a compact lawnmower to store, yet has the cutting capacity to cut even the biggest of lawns.